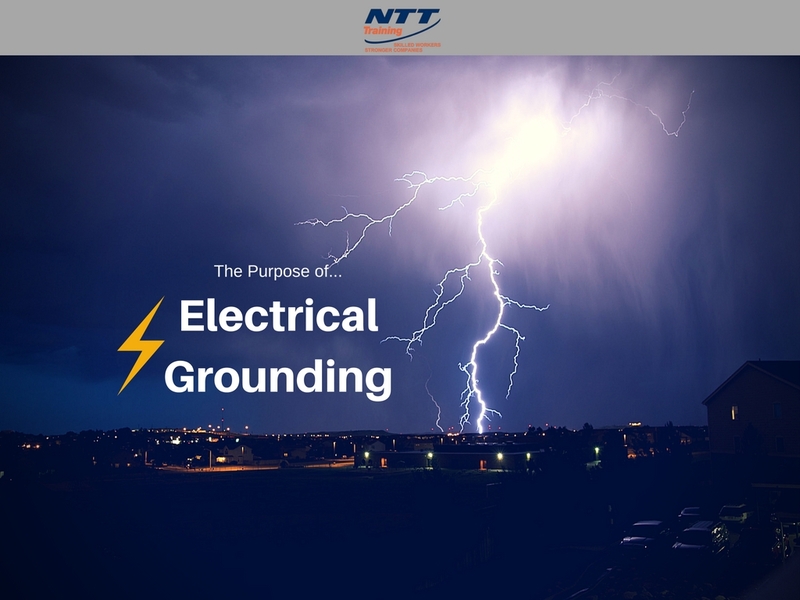 NTT Inc. - What is the Purpose of Electrical Grounding? What is the Purpose of Electrical Grounding? One of the most important safety measures in electricity management, electrical grounding refers to the practice of connecting an electrical device to the ground through a wire in order to direct any surplus electricity away from you while you use the device and into the ground. This helps prevent your receiving shocks upon coming in contact with the device. For any proper grounding (also known as earthing) setup, you will not be able to see most of the equipment used. That is because the grounding rods or plates will be buried deep in the ground, and connected to the electrical device through a wire of varying length, depending upon the amount of electrical charge that needs to travel through the wire and into the ground. – Protecting the workers who regularly come in contact with electrical devices that might give them a shock. To keep the voltage of the device constant in the healthy phase. This is in case a fault occurs in one of the phases. – In electric traction systems as well as in communication systems, grounding works as a return conductor. – Malfunctioning electric devices often leak electricity, which has the potential to start a fire if not redirected safely. – A good grounding path which has a low impedance value ensures that faults in the electrical path are cleared quickly. If the faults stay within the system for a long time, they can pose a serious threat to the stability of the system. – Many modern electronic devices generate a form of ‘electrical noise’ that can cause damage to the device and reduce its efficiency, unless the device is properly grounded. – Surge protection devices function better with the help of proper grounding. If the grounding is not carried out properly, it can cause a number of problems. – An improper grounding results in a higher potential being created in the equipment that could even move through the insulation gear you use to operate the machine and reach your skin. – It can cause a delay in the clearing of faults that will result in insufficient current flow. – It causes repeated electric shocks to you whenever you operate the machine. – The dangers of a fire caused by leaking electricity are increased exponentially. – It can cause a reduction in the operational efficiency of the machine. Grounding is a delicate process that needs to be carried out by experienced professionals. Several practices must be observed for efficient grounding. – The conductor used for grounding must be large enough to handle any faults that could occur with melting from the strain. Two things to keep in mind while choosing the conductor is the size of the potential fault and how long it will be running through the conductor. – The connections you use between the electric device and the grounding conductor must have the right kind of bonding and temperature limits for creating a reliable low resistance path for the electricity to move into the ground. – The resistivity of the soil plays an important role in ensuring efficient grounding. You should take care to pick the soil type that offers the lowest available resistivity, in order to have a reliably low ground resistance. In such circumstances, you need to pay special attention to the buildup of frost in the grounding area due to soil moisture and weather conditions. Ground frost increases the resistivity of the soil by an order of several magnitudes, and needs to be taken into consideration while designing the soil structure. – The location of the grounding area must be chosen with care. Areas which receive many visitors through the day have a higher chance of someone accidentally coming into contact with the grounding rod and getting a shock. – Other factors to keep in mind while scouting for grounding locations is the average temperature of the surrounding area, moisture content of the soil, the dangerous possibility of any kind of water reservoir coming in contact with the sensitive equipment. If you wish to understand electrical grounding and safety training in greater detail, get in touch with the professionals over at NTT. There you will find extensive resources and in-depth seminars that will expand your knowledge of electrical engineering and management!